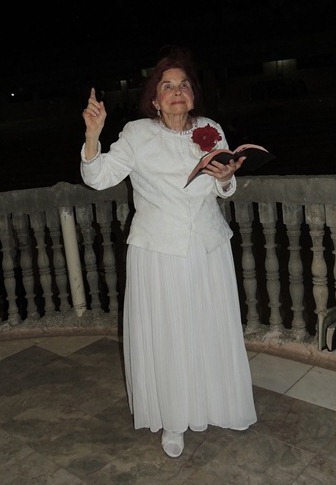 A daughter of the Azusa Street Revival and Mission, 93-year-old evangelist Verna Linzey, preached on the baptism with the Holy Spirit at another revival and mission in Los Angeles called Global Covenant Church, where a new move of the Holy Spirit erupted. An awakening occurred and five Filipinos and Americans burst into speaking in tongues as the Holy Spirit moved and gave them utterance while Linzey was ministering on the stage. The mission is pastored by the Rev. Alice Tanaka. This was the third time the mission invited Linzey to speak. The services are characterized by a lack of structure and an earnest quest for an encounter with the Holy Spirit as those who arrive at any hour seek the Holy Spirit. The services go on for up to three hours as they wait on the Spirit. Linzey did not characterize Pentecostal poverty of 100 years ago. Instead the evangelist epitomized the glitz and glamour of well-to-do modern Pentecostals. Linzey came from notoriety out of Coffeyville, Kan., the state giving rise to the Pentecostal Movement. Her uncle William Hall was a prominent doctor and businessman laying the foundation of the future of Coffeyville. The revival Sunday night was sparsely attended by about 30 people with a thirst for an intimate spiritual encounter with God. Historically, these are the kinds of spiritual climates where spiritual sparks are ignited by a combination of humility, openness to the Holy Spirit, and leaving time constraints outside the church door upon entering.